The VLTI (Very Large Telescope Interferometer) of the European Southern Observatory has observed that dust around a black hole at the NGC 3783 galaxy forms a cool wind that streams out from the black hole. This observation have surprised scientists since dust surrounding black holes have been observed to reach 700 to 1000 degrees Celsius. The dust can be found at the torus of the black hole. The torus, which resembles a three dimensional donut (as seen on the image on the left), surrounds the black hole and is believed to be the source of high energy objects called active galactic nuclei (AGN). The supermassive black hole pulls in material from the surrounding region but it seems that the resulting radiation and energy that this produces also blows it away. Black holes are regions in space where gravity is so strong that even light cannot escape its pull. Black holes are formed from stars that have exploded into a supernova and collapses into itself. Black holes vary in size with some being 20 times more massive that the sun. Supermassive Black holes can reach a mass more than a million times than that of the Sun. Each galaxy has a supermassive black hole in its center. The VLTI used to observe the black hole is made up of a combination of four VLT Unit Telescopes and four moveable 1.8-metre VLT Auxiliary Telescopes. It combines the light from several of these telescopes to form one observation through a process called interferometry. This process does not actually produce images but the generated measurements can be used to increase the level of detail of resulting observations. ESO’s Very Large Telescope Interferometer has gathered the most detailed observations ever of the dust around the huge black hole at the centre of an active galaxy. Rather than finding all of the glowing dust in a doughnut-shaped torus around the black hole, as expected, the astronomers find that much of it is located above and below the torus. These observations show that dust is being pushed away from the black hole as a cool wind — a surprising finding that challenges current theories and tells us how supermassive black holes evolve and interact with their surroundings. Over the last twenty years, astronomers have found that almost all galaxies have a huge black hole at their centre. 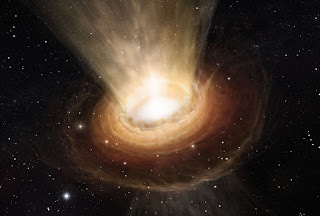 Some of these black holes are growing by drawing in matter from their surroundings, creating in the process the most energetic objects in the Universe: active galactic nuclei (AGN). The central regions of these brilliant powerhouses are ringed by doughnuts of cosmic dust dragged from the surrounding space, similar to how water forms a small whirlpool around the plughole of a sink. It was thought that most of the strong infrared radiation coming from AGN originated in these doughnuts. But new observations of a nearby active galaxy called NGC 3783, harnessing the power of the Very Large Telescope Interferometer (VLTI) at ESO’s Paranal Observatory in Chile, have given a team of astronomers a surprise. Although the hot dust — at some 700 to 1000 degrees Celsius — is indeed in a torus as expected, they found huge amounts of cooler dust above and below this main torus.